REGISTRATION IS CLOSED FOR 2012. Registration to CGA members begins in early 2013. For all students entering 4th thru 8th grade in Fall 2012. Classes will be held at Coppell Middle School North. Scroll down to see the list of full classes. You can wait list your student on our registration form. Costs (for one student during the same week) — Early bird registration discount information above in blue. CGA Members – $90 one course, $155 two courses, $220 three courses (for same student in the same week) plus any material fees. Non-members – $105 one course, $185 two courses, $250 three courses (for same student in the same week) plus any material fees. EARLY BIRD PRICING: We offer special early bird pricing and registration from Feb 8-22 for members, Mar 1-14 for non-members. JOIN CGA for the best prices and class availability. Your membership will pay for itself in class discounts. Please note: In the chart below, the numbers 4 to 8 indicate the grades that can take that course. Grade is based on Fall 2012. Check course descriptions for pre-requisite for classes listed as “Advanced” in the chart. 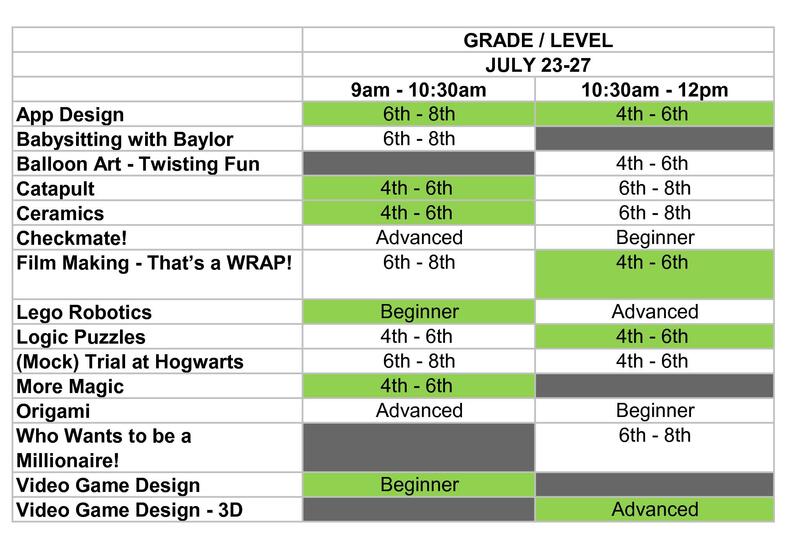 MOSAIC 2012 – Schedule July (Classes in green below are FULL. You may wait list the class on the registration form). NOTE: This table may not be up to date. Please scroll to the end for up to date class information. Would you like to create your own Game App? This course provides students with a fun interactive look at the world of mobile video game design and development. Students enrolled in this course will learn how to publish games to their favorite Apple® or Android™ devices. (Additional Laptop/Software Material Fee – $20; Pre-requisites – MOSAIC Video Game Design-Beginner). July 9a and 10:30 classes are full. Safe Sitter® prepares young adolescents for the responsibility of nurturing and protecting children through hands-on training with medically-trained experts. Successful completion of the educational program addressing these competencies is a standard for those who care for children. Explore new worlds of possibility as you discover the joy of twistable balloon art. Students will work on a 100 balloons and learn to create souvenirs made of bright, colorful balloons. Students will be provided with balloons, a balloon pump and an instructional DVD they can take home so the learning doesn’t stop in the class room. (Additional Material Fee – $10; It would be helpful if the student has the ability to tie a balloon). June 10:30a class is full. This course goes over the fundamentals of catapults, which includes the different types of catapults as well as the basic mechanics behind constructing one. The goal of the course is to help the students understand a level of basic physics as well as the different aspects involved in constructing a catapult for different situations. The course will end with students building a catapult with a given set of requirements and launching it to hit a specific target. July 9a class is full. Beginners will learn how each piece moves, the values, the board, development, control of the center, King Safety, material, pawn structure, space, tricks and traps, chess notation, good versus bad trades, openings, basic checkmates and endgame strategy.Advanced players will learn, openings, strategy, mobility (give your pieces and pawns somewhere to go and something to do), tactics, pins, skewers, double check, forks, sacrifice, decoying, deflection, blockades, calculation , planning, middlegames, endings, patience, learning from one’s mistakes, and checkmates. Do you know the difference between a film and a movie? Can you write dialogue that furthers the plot? Want to know the power of camera angles? Can you pick the right music for the story? By the end of this class, you’ll create a short video showing how all of these elements come together. July 10:30 class is full. Students will use LEGO’s to explore the world of engineering by building and operating LEGO Mindstorms software. They will use creativity and ingenuity to design their own solutions to problems. The Advanced LEGO Robotics is for those students that have already attended a MOSAIC LEGO Robotics class and would like to take the challenges to the next level. June 10:30. July 9a class is full. Are you the type of person that can’t let a problem go until you find a solution? Do you enjoy a good brain teaser or riddle? If so, then this is the course for you! We will apply mathematical reasoning and tap into our creativity as we tackle a variety of fun, challenging, and engaging logic problems. Let the brain exercises begin! July 10:30 class is full. Harry Potter is in the courtroom and you are part of the trial. You will learn about the justice system by evaluating and presenting a case based on the Harry Potter series (students need not have read the books to participate). Improve your advocacy skills by developing your ability to think critically and communicate effectively. What really happened in Ollivander’s Wand Shop? Will justice be served? Enroll to find out. Now you they see it – and now they don’t ! In this class, you will learn basic sleight of hand skills, as well as an overview of some basic magician’s props. You will also learn how to create magic from common household items make-it-yourself magic props, and learn how to put together your very own magic show. (Tricks taught will be different from MOSAIC 2011). July 9a class is full. Origami is the Japanese art of paper-folding. It is the magic of turning a simple square of paper into a frog, a flower or a fish – without tape or glue or scissors. The beginner group makes all projects together starting with basic folds and progressing to more complicated designs, with a different theme each day. The advanced group will spend the beginning of the class folding paper together and then continue on to independent projects. The advanced class requires knowledge of basic and intermediate folding techniques. June 10:30 class is full. This course is designed to teach students how to invest in stocks in a way that can potentially turn small amounts of money into thousands and, yes, millions, several years down the road. Students will learn that investing in stocks (partial ownership of businesses) can give intelligent investors breathtaking returns over time. During the week, participants will learn the ins and outs of stock investing and discover in a personalized way how to apply it to their own lives. Those who participate will leave knowing how to choose good companies to invest in and how to continue advancing as investors even after the week concludes. This course provides students with a fun interactive look at the world of video game design and development. Students enrolled in this camp will learn the basics of video game design and produce several different interactive video games to share with their friends and family. (Additional Laptop/Software Material Fee – $20). June 9a class is full. June 12:30 class is full. July 9a class is full. This class offers an interactive look at the world of 3D Game Design. The students will explore advanced features to video game design and begin working on the development of 3D games. (Additional Laptop/Software Material Fee – $20; Pre-requisites – MOSAIC Video Game Design-Beginner). July 10:30a class is full.